"..."The punch of the individual stories will keep you pinned to your seat!" Growing Up Gonzales is a comedy with drama in two acts. When Johnny Gonzales is forced to clean out the apartment of his recently deceased younger brother Cisco he discovers a treasure chest of private, personal notes left behind by his younger brother. The notes are pages and pages of events that happened in the past. They represent Cisco's innocent interpretation of love, life and everything in between. When Johnny begins to read these notes the magical journey Begins. "Growing Up Gonzales" by Felix Rojas, was performed April 17 to June 12, 2011 at the Sixth Street Playhouse in Alphabet City to full houses, but little notice. This "sleeper" play took the leap to Off-Broadway and was presented at the Jan Hus Playhouse, 351 E 74th Street as a 4 week limited engagement that turned into a 7 month run...followed by a brilliant and successful 4 week run at The Poet's Den Theater on the Upper East Side, a 5 month run at Teatro SEA in the East Village and a tour de force presentation at The Medicine Show Theater in Mid-town Manhattan in. 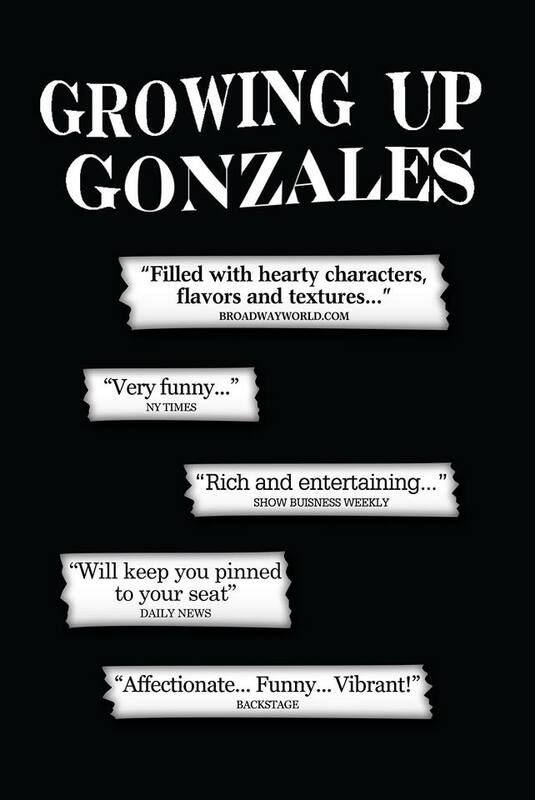 Growing up Gonzales has been entertaining audiences from all walks of life for six years.